Yeah for those without an augmented terp. 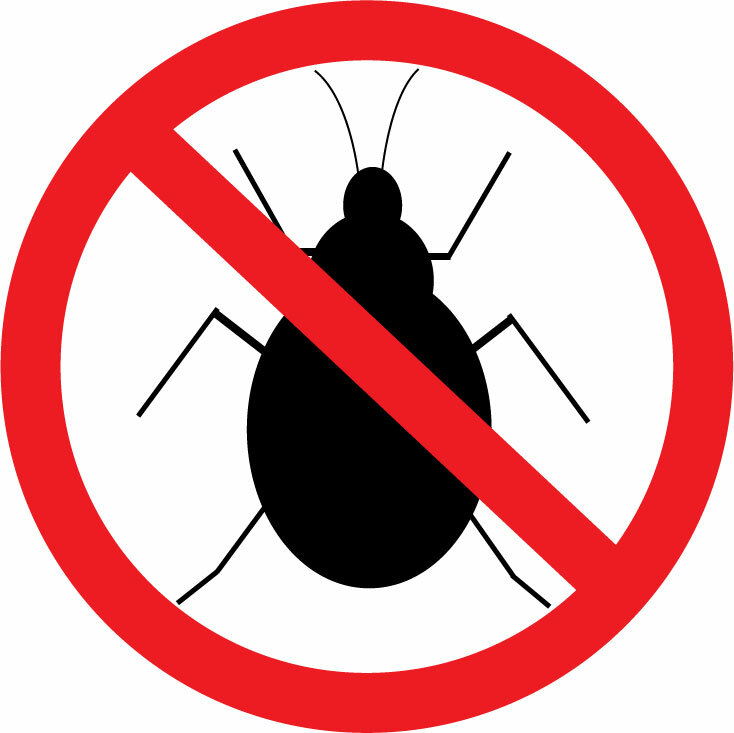 I'll be interested to see tests with pre-bug and post-bug gear sets from augmented REMA folks to see if there are any noticeable differences. I'd try this myself, but my terp isn't finished with augments yet (it's rank 11 as of this posting), and I don't quite have BiS pre/post-glitch sets. I suspect the spreadsheet folks will make the necessary tweaks in the coming days. According to Katriina's tests no, they're not worse than Lustratio+1 for Rudra. Search this thread, she posted the results. Difference wasn't big but, if I recall, +3 legs won over Lustratio+1. Unless I'm somehow doing the math wrong or messed up numbers completely? edit: Never counted offhand hit in my numbers for ftp, so there is one mistake. Oh I dunno, don't ask me. For all I know she could be the one who did some small mistake without noticing! Plus you're using 2x Lustratio+1 pieces, which means Set bonus, if I recall Katriina wasn't! But not sure about that. Personally I wouldn't use Lustratio+1 regardless. Maybe if you already have a couple of pieces and you paid a ton for them when they were still expensive and you somehow grew attached to them? I dunno. I'm way too annoyed by the lack of defensive stats and with my playstyle I find that matters a lot in recent content. I mean it matters more on jobs like RUN I guess, but on DNC too, for instance against the Dynamis Wave3 Megaboss, I find myself eventually getting hate, especially when I have Fan Dance up. It's also probably a matter of capped acc/att. I'm sure you can totally compensate for the lower Acc on Lustratio+1, but the attack difference is huge, plus STR which matters in the WS damage calculation, gives STR tiers and, indirectly, more attack. There are short fights where you're gonna be Att capped, but on stuff like Dynamis Wave3 you won't have Bolster Frailty up 100% of the time. Even with lots of att related buffs, it's hard to reach att cap on those targets when you take Bolster Frailty out of the scenario. In those situations the additional att is gonna matter. Did you try to run your tests making so that you have att buffs but that, at the same time, you're a bit below the cap? Because that's a much more common situation, I think, than being completely capped, something that will only be true for a portion of your fights but not all of them and not for 100% of the duration. 6% WSD herc boots? That DM augment. Try 4% with 15DEX or 5% with 10DEX. Also Like Sechs said there is a very significant drop is att and acc on Lustratio. Even more important (att) with +2 neck. Again, Sechs summed up things nicely, much appreciated! Bet the difference isn't huge though, is it? On spreadsheet it was a 200 difference between them [in WS set] if that helps. More often than not Attack isn't capped in higher content and the need for MEVA from support can limit the amount of buffs you receive [Especially if you don't have a second BRD/COR/SMN] and many players underestimate the attack provided on Relic Upgrades. These were done on the old spreadsheet, I will have to check again on the new one. Needless to say that, yes, it's much more logical to use Relic Legs over Lust in higher content for defensive purposes, and the mere fact that attack isn't always capped, especially on W3. Looking to check my PK set post ws update. Yeah, switching Fotia and JSE neck (even NQ, +1) would win [as spreadsheet showed]. When I fixed it, Fotia won by 600 over +2. Wouldnt adh. gloves +1 be a better swap in the hands department? 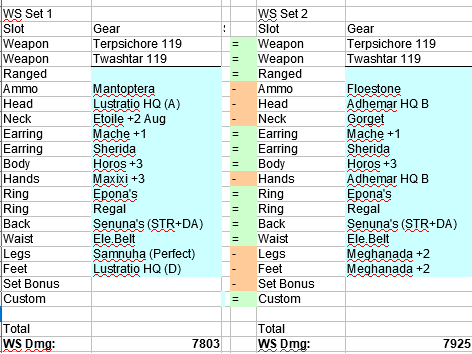 More STR/DEX/atk assuming path B, plus whatever amount TA would add, or does the +10 WSD actually outweigh all of that? I can't understand what you're doing in your set there. Fotia should go in the neck for Kleo. Does Physical Damage Limit +10% not beat fotia for PK if your attack is high enough? It depends on how it works. Do you know if it's straight up +0.1 pDIF, +10% pDIF, or +0.1 Maximum pDIF? One piece of Fotia is a 5.7% increase to Kleos damage. At 0.5 pDIF (floored), you're going to 0.6, which is a 20% boost. At 1.0 pDIF (even), you're going to 1.1, which is a 10% boost. At 1.5 pDIF, you're going to 1.6, which is a 6.7% boost. At 1.75 pDIF, you're going to 1.85, so a 5.7% boost. At 2.00 pDIF, you're going to 2.1, a 5.0% boost. If it's a flat +0.1 pDIF, at less than 1.75 pDIF (which is roughly you having 175 Attack for every 100 Defense the target has), then the Physical Damage Limit +10% wins. At higher than that, you should be wearing Fotia. If it's +10% pDIF, it will always be better, assuming it raises both your current and your maximum pDIF (which I assume it would, but if you assume Squeenix does anything logically or sensibly then you're going to have a bad time. If it raises only your maximum pDIF by 0.1, then it's going to be a 3.1% increase, or a 2.4% increase on a crit, only if you are above normal capped pDIF. If it raises only your maximum pDIF by 10%, then it's going to be a 10% increase in damage if you're sufficiently above normal capped pDIF. So, in two of these four cases, it will always be better to use Fotia unless you are over cap on pDIF, which would be 3.25. In one of these cases, it is always better. In one of these cases, it will be better to use Fotia in high buff situations, or against things with significantly lower defense than your attack, but better to use the JSE in cases where you have few attack buffs and/or the target has very high defense. This was already tested. It moves the maximum possible pdif up allowed by 10%. So for a 1h instead of 3.25 you can get up to a 3.575 (or however the game decides to round). You still need the attack gains to take advantage of it. If you can get to that pdif, there is no way fotia is better. Sorry for repeating it so much, but I feel like this is going to be another Thaumas Coat situation where people see something with a big number and fixate on it. If it's a maximum increase of 10%, then of course it's going to be better if you can hit that much ATT vs DEF. However, in any situation where you are less that 5.4% over the normal cap, Fotia wins. Period. Like, I apologize because I'm sure that comes off as me being an ***, but I cannot repeat this enough when it comes to stuff like this. There are going to be tons of people who see that "Physical Damage Limit +10%" and go and waste 200 million gil on something they will almost-never-to-never see the benefit of (from that stat.) And given the other stats on it, outside of Rudra's Storm and Violent Flourish, it looks like it's pretty much a Curing Waltz swap piece. And 200 million is a lot to pay for that, because you shouldn't be using Rudra's most of the time in the first place, and that macc on it likely isn't going to be enough to make a difference with Violent Flourish to start with, so you're basically paying 200 million gil for essentially the BiS Waltz piece. Uh...ok? So basically you just repeated what I said? I put the "if" in my statement for a reason, bro. I am glad you used it 4 times instead of once but it means the same thing as I wrote. The neck also has a fair amount of DEX so the threshold is not as high as 5.4%...but conceptually you are correct. I put the if in my statement for a reason, bro. I am glad you used it 4 times instead of once but it means the same thing as I wrote. I get that you put the 'if' in there for a reason. I repeated it like I did for the benefit of others, not you, because there are plenty of people who are going to need that reinforced to make them see the actual benefits of it, because, again, like I said above, there are way too many people who are going to see that "Physical Damage Limit +10%" and think it's way better than it is, and almost all of them could probably spend that money better on something else. I won't tell people how to spend their money in real life and I also avoid it here. People should understand what they are getting, the benefit they will derive from it, and make the determination themselves. With that being said, I think you are devaluing this piece too much - it's great. 1.) With all of that Acc, Dex, and STP is there a better TP neck even when you get no value from the higher pdif? 2.) BIS Rudra's piece by a mile. And the CHA even helps with Climactic. 3.) Best Waltz piece (some DNC value their waltzes highly, some forget they even have it). People come into this thread for advice and to figure out what's worth what. I am more than willing to give someone my opinion on what their money is worth. That gorget's going for ~80m on Asura at the moment. That's half the alex for a mythic, the HMP for a Twashtar, etc, etc, etc. People come into this thread because they either are not, or assume they are not, as knowledgeable about the mechanics and minutae of the job, or perhaps they want the perspective of those with more experience on it. Who cares about accuracy and dexterity in TP phase when you're already past accuracy cap and capped on dDEX? I have 341 Dexterity in my haste capped TP set. What are you fighting that you need 366 DEX to cap dDEX? And Anu Torque has STP+8 along with ATT+20 and Resist Stun +10. Sounds like a better TP neck to me if I want StoreTP while not over pDIF cap. Okay, so far, we both agree that this is a 80m piece for a WS you should rarely be using, and for a specific JA. There are a ridiculously large number of ways you can cap Waltz Potency. If someone's looking at buying an 80m piece in part because it has +25% waltz potency on it, there are other options, and likely better ways they could spend that money. If you care so much about your Waltz Potency set I imagine you've got something like Dualism Collar +1, which gives CHR+8, which means you'd be gaining 17 CHR off this. Doing the math, with capped Waltz Potency, you'd get 6 more HP cured on Curing Waltz I and Divine Waltz I, 12 more HP on Curing Waltz II and Divine Waltz II, 18 more HP on Curing Waltz III, 25 more HP cured on Curing Waltz IV, or 31 more HP cured on Curing Waltz V.
My Curing Waltz V, on myself, before Waltz Potency Received, should restore 2019 HP. I only have a Dualism Collar, not the +1 version, so I would gain 19 CHR off this, which would mean my Curing Waltz V would go up to 2055. That's a 36 point increase.A 1.783% increase. My Curing Waltz III, similarly, should cure me for 840 HP. With 19 more Charisma, it'd heal for 861 HP. A 2.5% increase. My Curing Waltz I should do 201 HP. With 19 more Charisma, it'd do 208. A 3.48% increase. I have 1903 HP in my Haste Capped TP set. This is bad. This is bad for anyone who doesn't have anything better they can spend the money on for their Dancer, and even then, it's ridiculously situational. This is a bad item. There is nothing to like about this neck except the Physical Damage Limit, which is, again, ridiculously situational. It is bad. What you are saying has so much logic flaws, that I don't know how to start with this. Who cares about accuracy and dexterity in TP phase when you're already past accuracy cap and capped on dDEX? So you assume people are always acc capped on everything, but almost never att capped? I assume you are playing solo and doing mainly semi old end game like Omen? Not everyone do what you do. You are also thinking about it VERY bluntly without any imagination. If you are way past acc cap, then you can try to get something out of it. The obvious example would be using a Centovente because if you can hit the acc cap with it, it's bis. Smaller change would be changing path A to B on some of your TP Adhemar pieces. Lastly Etoile +2 is by far the first thing you would want to change into for medium or high acc sets. You lose 20 att and gain almost 44 accuracy. It's actually a change from normal to medium acc set with one piece of equipment and you lose almost nothing. Dude. Are you really suggesting that people without mythic should use Pyrrhic over Rudra's or you suggesting that people with mythic (and Twashtar offhand judging by your dDEX) should drop their weapons to farm for them again? Even without huge advantage of that neck presented above, it's worth 80M just because of how strong Rudra piece it is. Rudra's is by far the best WS oyou can use without mythic and if you are solo, you will still use it frequently with mythic too for skillchains and Climatic. This is a bad item. BIS Rudra neck by FAR. BIS PK neck at capped att. Still a bad item guys!! I agree with Simon, and I don't own (yet!) a +2 neck yet so don't call me biased! Yes, there are some stats that are sorta "wasted" and other more DD-focused stats could've been in their place. This doesn't change the fact it's an awesome piece even if you don't consider the lovely PDL stat. Pyrrhic Kleos: 4 hits, 1.75 fTP, Replicated. With Fotia: 1.95. 1.95 x 4 = 7.8; additional hits can bring it up to 'effective' 15.6fTP. This is before the Mythic's bonus to the WS. Rudra's STorm: 1 hit, 5.0fTP @ 1kTP, 10.19fTP @ 2kTP. 13fTP @ 3kTP. TP required to hit 7.8: 1560 or 1310 with Moonshade. TP required to hit 13: 3000 or 2750 with Moonshade. TP required to hit 15.6: can't do it. Hmm. Let's see. What's a larger number? 7.8, or 5? The only time you should be using Rudra's is it's either stacked, closing a double darkness, or you're trying to cheese a weak-to-piercing popped NM with someone opening for you to close a large, climactic, building Rudra's. If you have an Aeneas, spamming Rudra's at 1kTP with Moonshade would get you an fTP of 8.8925... and then the offhand hit from Kleos lands and now you're only 0.025 fTP ahead of it. Or you could hold to 2250 to do a 13fTP Rudra's, except in that time I'll have done two Kleos. You completely misinterpret what I said about ACC and DEX. It's okay, though, sarcasm is often lost in text, and I should have been less bitchy. I still insist it's a bad item. It's BiS for Violent Flourish, it's BiS for Rudra's Storm, it's BiS for Waltz, except that there are plenty of other easier and better ways to cap Waltz Potency, you shouldn't be using Rudra's Storm as your bread-and-butter, regardless of if you have a mythic or not, it is not the best TP neck. Have you actually done any spreadsheeting, or done the calculations yourself, or are you just fixating on a pretty shiny thing and insisting you're correct? I feel like I've had this exact same discussion before, but about Thaumas Coat. What do you need this item for? Are you unable to cap your waltz potency without this item? Edit: holy ***my sleep deprived brain thought this had Waltz Potency +25% on it, not +10%. So sorry. Do you not use Pyrrhic Kleos? I'm seriously not trying to be an ***, I'm just trying to understand why you seem to think it's as good as you think it is. You might want to go learn more about the fundamentals of Dancer before you start trying to give advice. Lol now I'm not sure if you are trolling or are you just being ignorant. You again ignored so obvious things that I don't know how to start. Your comparison of Rudra's and Kleos only with fTP is again so flawed that I again don't know how to start. 2. Another difference is 80% DEX mod on Rudra's vs 40% STR and 40% DEX mod on Pyrrhic. On first it might look similar because 40%+40% is also 80%, but it's much easier to stack one stat (especially DEX on DNC) than two, so again Rudra's has advantage here. 5. If you utilize Darkness skillchain created by spamming Rudra's, then it's not even a contest and Rudra's wins by miles. 6. Natural TP overflow favors Rudra. TL;DR despite your ignorant comparison between Kleos and Rudra's (or was it sarcasm again?) Rudra's storm is a better WS to use on non mythic DNC and afaik Twashtar+Centovente Rudra's setup beats even mythic Kleos setup. Ahahahahaha... I love when ppl say/write something like this after being ignorant af and showing complete lack of knowledge. Use your own advice. Dude. You're right. I was confusing it with Ainia.